An impossible coincidence implicates six University of North Dakota (UND) police officers as being involved in a cover-up of the true facts and circumstances surrounding the shooting of David James Elliott on February 28, 2015. Write Into Action has discovered UND police officers Mark Thorpe, Jayson Waltz, Jerad Braaten, Danny Weigel, Frank Lanasa, and Heather Hopkins were clearly involved in the events that led up to the shooting of David Elliott. On February 27-28, 2015, local, county, and state police in North Dakota pursued David Elliott through multiple counties before he was shot six times – three times in the head – in the Altru hospital parking lot. Elliott was shot by UND police officer Jerad Braaten. Law enforcement refused to talk to the media for three days after the shooting. When a press conference was finally held, the story given was that Grand Forks Police were dispatched to Wells Fargo Bank at 10:41 P.M. after the cleaning lady called and reported a suspicious vehicle that had been parked in the parking lot for about an hour. According to police, a GFPD officer attempted to stop David Elliott and a high-speed chase ensued. The pursuit was called off by a GFPD supervisor. But that story is not holding up. According to the official story, only two UND officers (Jerad Braaten and Heather Hopkins) were involved in the Elliott pursuit. Hopkins was an intern and was riding in Braaten’s car with him. And – according to Braaten and Hopkins in their statements to the ND BCI, they were not involved in the initial pursuit of Elliott around 11:00 P.M. Braaten and Hopkins said they only became involved at the very end of the pursuit, which was well after midnight. UND officers Thorpe, Waltz, Weigel, and Lanasa were never interviewed by the ND BCI after the shooting and have never been suspected as being involved. Police records show that cannot be true. Evidence shows all six UND officers were involved from the very beginning. 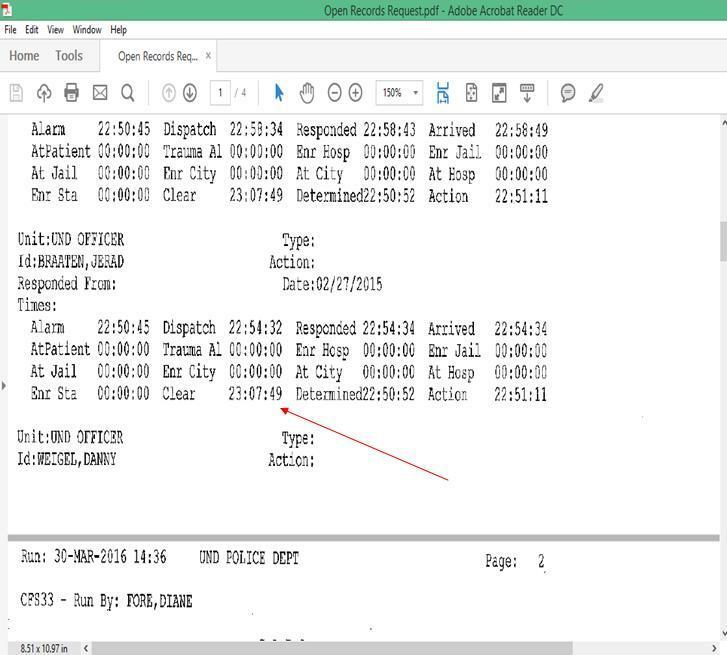 The evidence is found in a comparison between a GFPD officers dash-cam, and UND police dispatch records, which shows what was really going on. The initial pursuit of David Elliott down I-29 by the GFPD was officially terminated at 11:07:42 P.M. 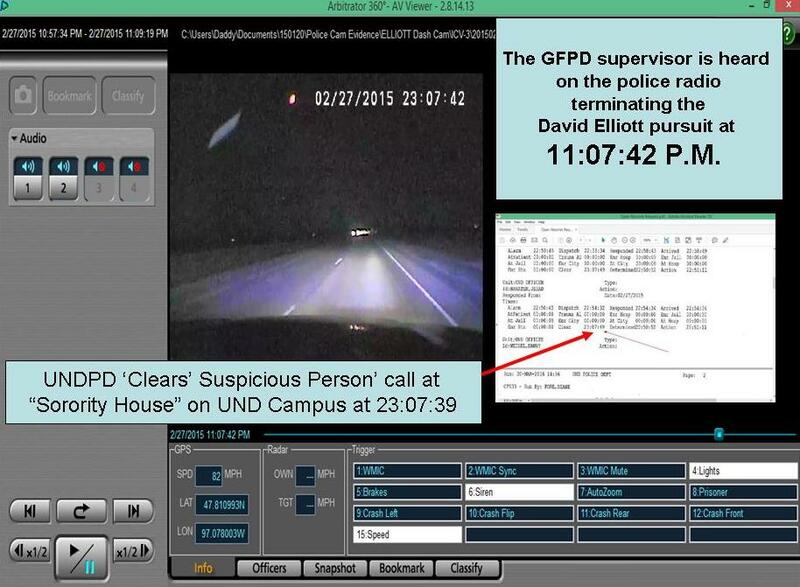 Furthermore – dash-cam evidence from the GFPD squad car shows the officer began following Elliott at 10:57 P.M. and activated his red lights at 10:58 P.M.
That corresponds exactly with the time the police dispatch records show the six UND officers begin to ‘Arrive’ to the ‘Suspicious Person’ call that was placed at 10:50 P.M. It all began and ended at the same time. UND Police Department Officer JERAD BRAATEN, Grand Forks Sheriff’s Office Sergeant Andrew (Andy) Schneider, Grand Forks Sheriff’s Office Deputy Nathan (Nate) Moen, Grand Forks Police Department Sergeant Mark Ellingson, Grand Forks Police Department Corporal Wesley (Wes) Vert III, Grand Forks Police Department Officer Christopher (Chris) Brown, NDHP Trooper Matthew (Matt) Peschong, and NDHP Trooper Brittany Schmidt were involved in a pursuit with DAVID ELLIOTT. There is absolutely no mention of UND officers Thorpe, Waltz, Weigel, and Lanasa. Elliott’s vehicle was found to contain “thousands” of pills on the night he was shot by police. However, nobody was ever criminally charged regarding the pills.